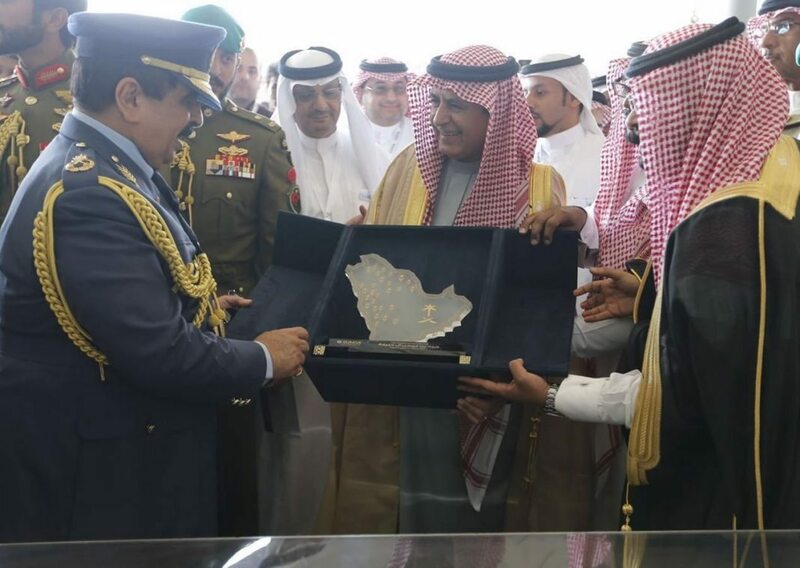 His Majesty King Hamad Bin Isa Al Khalifa, the King of Bahrain, visited the Saudi General Authority of Civil Aviation‘s wing at the 2016 Bahrain International Airshow on Thursday. The Authority is a strategic partner of the airshow, held for the fourth time at Bahrain’s Al-Sukhair Airbase, with 139 companies and 75 delegations attending, and 100 civilian, commercial and military aircraft on display. His Majesty King Hamad was met by Sulaiman Al-Hamdan, the Authority’s President, and a number of GACA officials. His Majesty was given a detailed presentation by Hamdan on future plans for the Saudi aviation industry, and the Authority’s initiatives as to the regulation and development of Saudi Arabia’s air transport industry, as well as development and modernization operations at the Kingdom’s 27 national airports and progress so far. King Hamad expressed his pleasure with the Saudi exhibition of development projects at the Kingdom’s airport. In a speech, Hamdan thanked King Hamad for his visit, saying that it made him and every member of GACA proud, and that his visit is a manifestation of his keen interest in the aviation sector. The Authority is attending the airshow with a large, comprehensive wing that showcases all of its sectors, projects, national carriers, and civil aviation service providers, in a display of the Kingdom’s progress and advancement in this industry. GACA‘s wing has proved to be extremely popular with representatives of organizations and institutions concerned with civil aviation, as well as major operators, specialists, and enthusiasts the world over, thanks to its offering a wealth of information, statistics, insights on development projects, and GACA‘s outlook for bolstering the Kingdom’s air transport industry.